Better technology drives more engaged learning. Getting students engaged in the classroom is always challenging. Keeping them engaged is often the more difficult battle! 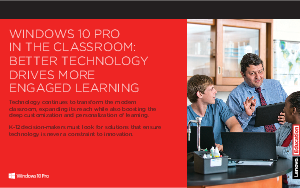 Windows 10 Pro paired with innovative Lenovo tablet, laptop, and desktop computers provides the perfect user experience-driven solution — where technology is never a constraint to innovation or engagement. Learn more, get this eBook.